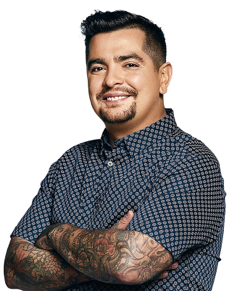 Chef and "MasterChef Junior" judge Aaron Sanchez kicked off season 7 of "MasterChef Junior" along side Chef Gordon Ramsay and Christina Tosi. With contestants ranging from 8 to 13 years of age, season 7 has a diverse set of contestants with a variety of skill levels. Even as each episode takes the contestants through wonderful challenges, with different contestants standing out and making their mark, Sanchez was thrilled to find that this season got started off well. The challenges are made to not only let the contestants showcase their skills, but the contestants are pushed to their limit to be able to fine tune their skills as well as gain new ones. Many of the contestants have been cooking and baking with their parents from a young age, so their skills are already impressive. Sanchez said that the challenge he was looking forward to the most was the restaurant takeover because even as an adult that challenge is difficult. The restaurant takeover challenge is challenge that is exciting to watch and the contestants put everything they learned through the weeks of competition and their personal journey to action.